Get your products & services in front of our avid audience! You can get in front of our attendees by advertising in our program guide. Buy Your Ticket at the Door! No advance tickets required. I Always Wanted to Play the Harp! Buy Your Visitor Ticket at the Festival Registration Desk & Come On In! "This is the best harp festival." Jakez Francois, president of Camac harps. "Thanks for working so hard to make this the best festival in the known universe!" says Amy Roberts, Virginia Harp Center. "Somerset is one of our favorite conventions! Always fun!" says Melissa Irwin at Rees Harps. "Somerset has the biggest selection of harps ever in one place," says Sharon Thormahlen. Conference Attendees: your registration includes admission to the Exhibit Hall for the day(s) you're registered. Be sure to wear your name badge! General Public Admission: not attending the conference? That's OK. Purchase your $15 admission badge at the festival registration desk at the Exhibit Hall entrance. It is a blind testing that allows the audience to hear and compare the sounds of several harps without knowing their brand. The tasting is conducted in the concert hall with the listeners with their backs to the stage, where the same piece is played on each harp. Audience members are given evaluation sheets which they can use strictly for their own purposes. There are "no winners" at a harp tasting since every musician has different criteria by which they judge and everyone has their own likes and dislikes. There will be tasting for small harps - 29 strings and fewer, and over 29 strings. Depending on interest, there may also be a testing of other harps. 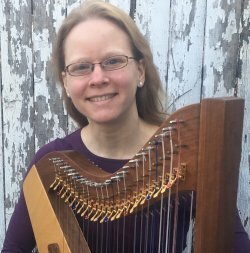 Liza Jensen, a certified harp technician for Camac harps, will be back at the festival this year ready to do harp regulation and repairs. 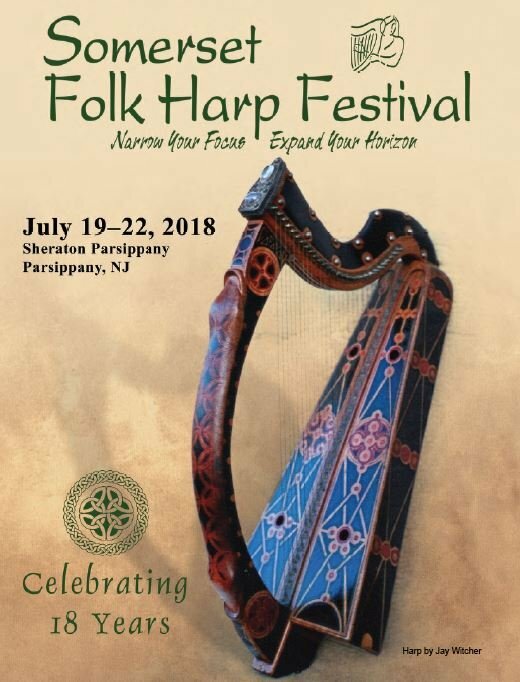 You can schedule time to drop off your harp by emailing Liza directly in advance or signing up on the sheet we'll have at the Registration Desk at the festival. 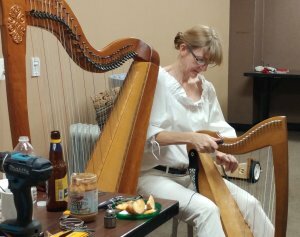 Liza will also be doing a 1-hr DIY Harp Maintenance on Friday and Saturday at 11:30am to show you how to tie strings, make simple adjustments and diagnose and fix those annoying buzzes. Bring your harp to that one! Build Your Own Harp from a Kit! 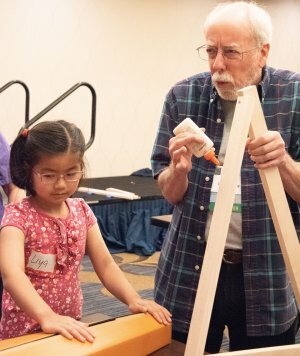 Come build a Waring Harp with Professor Dennis Waring. This is a 2-session workshop. You'll have an opportunity to build your own 19-string harp from the Waring Music harp kit, special discount rate of $125 if you pre-order ($165 on-site). All materials and tools are provided. The first session is the construction of the harp frame & body and the second session is for stringing your instrument. Harp features: Strings and spacing meet modern standards. Encompases over a two-octave range, suitable for basic repertoire. Has 19 strings beginning with G below middle C. The high- grade corrugated cardboard sound box is extremely durable and when painted is resistant even to rain. Non-conference participants can buy their kit on the day of the workshop ($165). Class limited to the first 12 people. To pre-order your kit and pay only $125, contact Dennis before the festival with questions and to pay for your kit. Have you ever said to yourself "I always wanted to play the harp"? Experience a harp first-hand, literally. We have a 45-minute workshop offered to any of our daily Visitors. Sure, you're coming for the day to check out the Exhibit Hall and maybe go to a concert, but this mini-workshop is intended as a "get acquaited" session. Robbin Gordon-Cartier is an experienced harper and teacher and she'll get your hands on a harp. There's nothing to be fear or feel self-conscious about. Learn how to make a "joyful noise". Ask questions. Get answers. After this workshop be sure to attend the daily "harp tasting" and be the judge on what kind of sound you like in a harp.